Faraway Press: The Online Home of John Jackson Miller: Reporting for duty: Star Trek: Titan - Absent Enemies! Awesome, please give us some continuity nuggets. Heh! 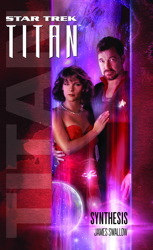 A little early, but here's a little one: we will be seeing other non-Titan TNG crew in it. I'll explain more later.